In the fall of 2013, we asked ourselves what we’d learn if we made a broadside ballad from the ground up; The Making of a Broadside Ballad provides our answers to that question. Taking cues from the so-called maker movement and adapting them to the rigors of humanistic inquiry, the makers of this volume undertook an ambitious training program alongside professional craft workers from across the country, including papermakers, woodcarvers, ethnomusicologists, and printers. 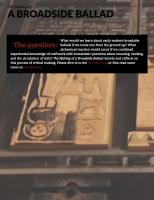 We made paper from used clothing, carved woodblocks from planked box-wood, composed ballad-style verse, recovered an early modern tune, set type, printed the cuts and type together, and then performed our product, "The Ballad-Makers Complaint." This document records and reflects on the process of critical making. Read The Making of a Broadside Ballad here.